RMK has been awarded two certificates – ISO 14001 environmental management certificate and FSC forestry certificate. An environmental management system is that part of the general management system that includes division of labour, obligations, practices, procedures, processes and recourses that are necessary for the development, implementation, and performance review of environmental policy. RMK has developed an environmental management system meeting the international ISO 14001 standard. 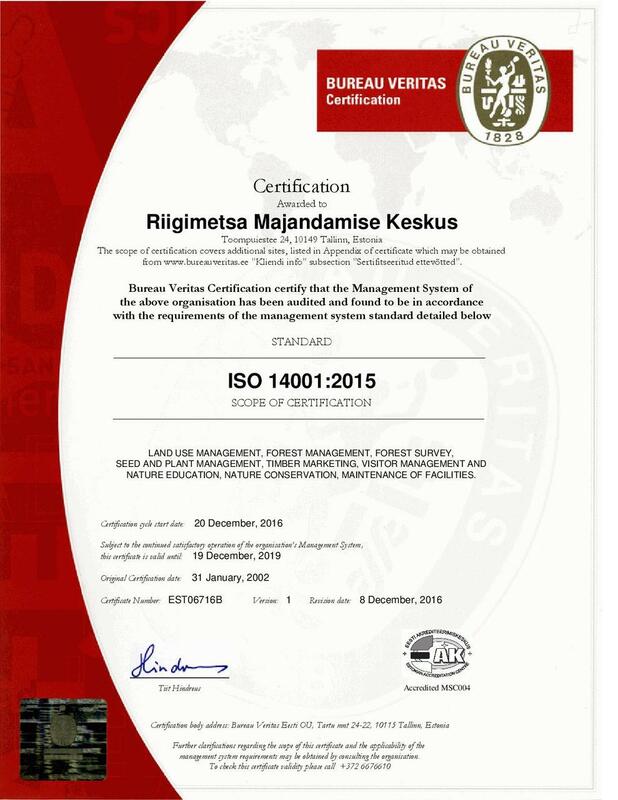 RMK has had the ISO 14001 since 1 February 2002. The certificate is valid until 19 December 2019, when a new re-certification audit will be conducted and the validity of the certificate will be extended for another three years. A quality management system, like an environmental management system, is part of the general governance of an organisation; however, in its case the organising of management procedures aims to ensure continued customer satisfaction. RMK obtained an ISO 9001 certificate on 20 December 2010, and, as with the ISO 14001 certificate, a re-certification audit will be conducted every three years. This ISO 9001 certificate is valid until 19 December 2019. Forest Stewardship Council®, an international non-profit organisation engaged in forest certification, has developed the principles and criteria of sustainable forest management based on which it is possible to assess the economic, social and ecological sustainability of forest owners’ activities. The FSC logo marks products the composition of which includes timber from a well managed forest. The FSC principles of sustainable forestry cover the implementation of laws and international agreements, the right of ownership and use of land, the rights of indigenous people in forest management, social relationships and the rights of employees, the assurance of benefits gained from the forest, the existence and quality of forest management plans, monitoring and evaluation in forest management and preservation of forests with a high conservation value. RMK holds the FSC certificate since February 1st, 2002. As a result of a certification re-assessment carried out in 2016, the validity of the RMK’s FSC certificate was prolonged until January 31st, 2022. PEFC is an international non-profit programme for the endorsement of forest certification, bringing together more than 30 national certification systems.In Estonia, the Eesti Metsasertifitseerimise Nõukogu (Estonian Forest Certification Council) is the representative of PEFC.The overall objective of the Estonian forest certification scheme is to support the implementation of sustainable forestry in Estonia.RMK (the State Forest Management Centre) has held the PEFC certificate since 29 November 2010.